Known as the brand that 'ate' its parent, Pontiac has contributed some of the US car market's most memorable and significant models. When created in 1926, Pontiac was intended to serve as a low-cost offshoot of General Motors' Oakland brand. Five years later and battered by the Great Depression, it was Oakland that folded and allowed Pontiac to continue on alone. Slotting into a market niche between the Chevrolet and Buick ranges, 1930s Pontiac models were inexpensive yet retained the prestige of Oakland's eight-cylinder engine. Automatic transmission became available in 1948 and, by the mid-'50s, more than 90 per cent of Pontiacs had Hydramatic transmission. Also introduced during the '50s were model names, like Catalina and Bonneville, that would become synonymous with the brand for decades to come. Pontiacs sold in Australia during the '60s were predominantly Canadian-made four-doors shipped here as kits for local assembly. The four-cylinder Tempest introduced in 1961 was a commercial disaster that lasted just three model years. However, its legacy was the mid-sized Le Mans that in turn gave rise to the most important model in Pontiac history. The GTO was a Le Mans option pack introduced for 1964. With a beefy 6.5-litre V8, manual transmission and heavy-duty suspension, the keenly-priced GTO exceeded first-year sales projections by 2000 percent. Having already inspired the musical hit Little GTO for Ronnie and the Daytonas, the GTO's youth-market profile received a further boost when a modified convertible starred in The Monkees TV series. Having created the muscle car during the '60s, Pontiac continued to contribute to the genre's development. The Firebird began life as a Camaro derivative but emphasised its individuality during the 1970s via big-engined Trans Am and Super Duty versions. 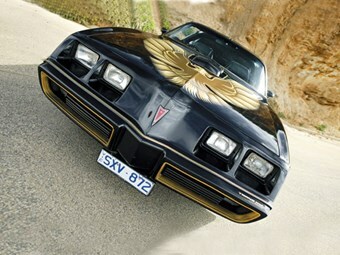 Most famous was the black 1977 model from Smokey and The Bandit (pictured here); this evocative Pontiac is about to be commemorated in a 30th Anniversary edition by US customising company Year One. Small-screen kudos followed in the shape of David Hasselhoff's 'talking' Trans Am, KITT, but Pontiac's only inducements to enthusiastic '80s drivers were 5.7-litre GTAs and a 20th Anniversary Trans Am Turbo V6 that would race to 100km/h in six seconds. By the mid-'90s Pontiac had abandoned individuality in favour of cloned Chevrolets and mini-vans. However the wisdom of a marketing philosophy that has avoided big, gas-guzzling SUVs and the inclusion for 2009 of some sporty Holden-made models may yet be the salvation of a brand with proven ability to survive tough times.